Home > The Pinnacle of Polishes and Protection > Nicks Preferred Blend 1012 Scratch Out - 8 oz. Nicks Preferred Blend 1012 Scratch Out - 8 oz. The ONE AND DONE Compound:Great for those deeper scratches that need a tougher cut but also polishes while using less pressure and a polishing cloth or pad. Body Shop Preferred:From start to finish with only the change of a buffing pad. A specially formulated paint leveling compound designed to remove 1000 grit or finer sand scratches with a Wool or Foam Pad. 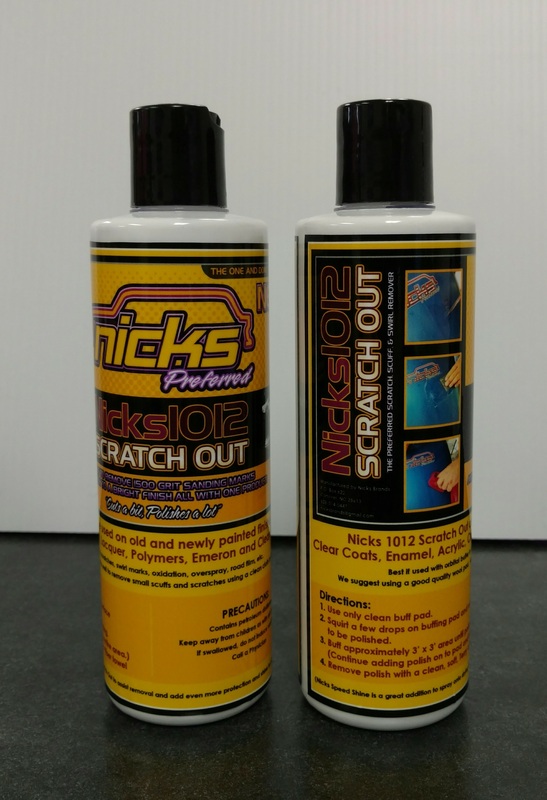 We recommend using "Nicks Preferred Blend 902 Rub Out" after this product to complete the polishing process and add monthes of protection.